Official eight 2017 MMFF entries revealed - Balita Boss! 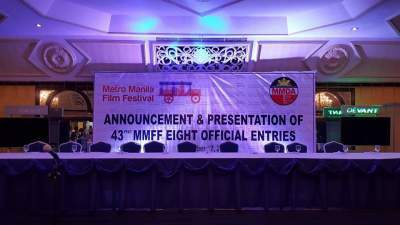 The Metro Manila Film Festival (MMFF) executive committee has announced on Friday, November 17, the last four official entries of 2017 MMFF or 43rd MMFF. The first 4 entries in the 2017 Metro Manila Film Festival this coming December was announced on Friday, June 30. Hosted by Muntinlupa City, the annual competition of Filipino movies will start on December 23, with the awards night on December 27. 1. "Ang Panday" directed by Rodel Nacianceno produced by CCM Creative Productions, starring Coco Martin, Mariel De Leon, Kylie Verzosa, McCoy De Leon, Elisse Joson and Ms. Gloria Romero. 2. "All of You" directed by Dan Villegas produced by Quantum Films and MJM Productions starring Jennylyn Mercado and Derek Ramsey. 3. "The Revengers" directed by Joyce A. Bernal produced by Star Cinema and Viva Films, starring Vice Ganda, Daniel Padilla and Pia Wurtzbach. 4. "Meant to Beh" directed by Antonio Y. Reyes and produced by Octo Arts Films, starring Vic Sotto and Dawn Zulueta. 5. "Deadma Walking" directed by Julius Ruslin Alfonso from T-Rex Entertainment, starring Joross Gamboa, Edgar Allan Guzman, Dimples Romana, Candy Pangilinan (Candiva Lacrofasia), Bobby Andrews (Robert Andrews), Ricci Chan, Patricia Ismael, Nico Antonio, Jojit Lorenzo. 6. "Siargao" produced by Ten17 Productions and directed by Paul Soriano, starring Jericho Rosales, Erich Gonzales, and Jasmine Curtis Smith. 7. "Haunted Forest" produced by Regal Films and directed by Ian Loreños, starring Jane Oineza, Jameson Blake, Jon Lucas, Mariz Racal and Jerald Napoles. 8. "Ang Larawan" from Culturtain Musicat Productions, directed by Loy Arcenas, starring Rachel Alejandro, Joanna Ampil, and Paulo Avelino, with Nonie Buencamino, Celeste Legaspi, Zsa Zsa Padilla, Ogie Alcasid, Menchu Lauchengco Yulo, Sandino Martin, Cris Villonco, and Aicelle Santos.